I love witches. I love Tarot. On a recent Tarot tour of Italy that encompassed so many towns my journal and memory were on overload, delightfully of coarse, I landed in Bologna. It was here that I realized the love affair with Witches. It started on Via Porta Nova, my feet moving along another beautiful cobblestone street. But this was different, for my eyes came upon an entire shop devoted to tea and witches. 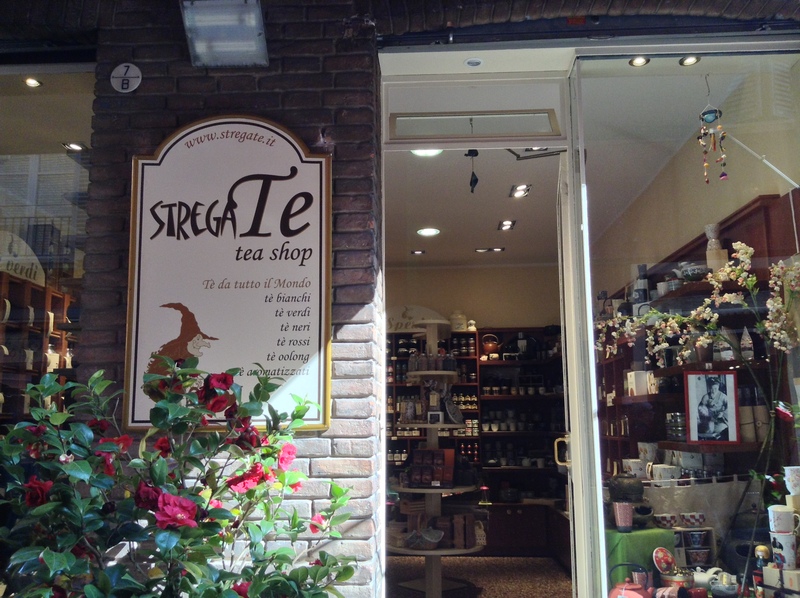 The Stregate Tea Shop. It was the witches in the window that stole my heart, it was the wonderful tea inside that made me linger. “I wish we had a place like this at home’ I said. I wanted to take it home and so I did, the witches are in my kitchen now, and some teas from the shop too. Stregha witches are synonymous with Italy, but until Bologna I hadn’t seen any. Outside of Bologna is a small place called Riola. Nestled in this tiny hilltop village is a Museum dedicated to Tarot. It was at a garden party here that I found more witches. The Museum had so many tarot decks, out of print, one of a kind signed, works of art with a tarot theme. It was awesome, and Morena Poltronieri is the proprietor and originator of this amazing place. Food, entertainment and artists that had also been invited, awaited us. As I was wandering inside awestruck a friend was comingthe hanges witches toward me with dancing eyes and waving hand, “you have to go in the next room, your favorite thing is on the table”. What, I said, “just go see” she said. So I did, and laughed with delight. A little tarot deck of stregha witches met my gaze. The Abracadabra Tarot by Maria Rita Frazzoni will delight any lover of witches. The Sun- her face here is my face. Too much heat and longing for Fall. I scrunch my face like her and draw the shades! The World-her nose against her crystal ball. I love her bigger than life stubby fingered hands too. The Hermit is a delight to look at, as she stands atop the hill overlooking her world, broom in hand. The Hanged Man/Witch is a metaphor to me, of all the hanged witches through history that ever felt a noose. Strength has her glancing into her book of shadows for wisdom and a good spell. I’d love to read her book.